What do you do when you have three weeks to create a room & no closets… you run to tried & true ideas that you know will work (i.e. the headboard reinterpretation of our table) as well as this simple solution for a garment rack. I am not the first, nor will I be the last to recreate a Garment Rack made of Steel Pipe, but the look & more importantly the function was exactly what the room required. I was mostly inspired & referred to my friend Anna’s Tutorial over at In Honor of Design. (btw… there is more coming from Anna & I in the very near future!!) I followed her basic idea, only altering slightly by adding a second shelf at the bottom. This has been great for shoes & a stand in bookshelf. Until we know what further storage needs he will require, we have considered either adding a third shelf to the bottom (he’s 6’3″… higher is totally fine!) or mounting a shelf above. But for his basic storage needs, this has been more than helpful. The great thing about this project is that if you do your math & planning ahead of time, you can create the entire piece without having to cut a single item at home. There are so many variations in sizes/lengths of pipe that you can literally create exactly what you need. We also utilized the store cutting the wood for us. This always saves the hassle of having to pull out the power tools. Especially when it’s cold & rainy. Not the best time of year for big projects! The only other tip I will suggest is washing all the pipe before hand with a good degreaser (a good dish soap like Dawn will do the trick!) This will save your hands from getting filthy & ensure that paint, should you choose to add it, will stick. I left ours the standard pipe finish except for the brackets & elbows… I added a quick shot of gold spray paint to those. I love how the pipe relates back to my beloved Chrome Wassily Chair. This chair was my first real furniture purchase over 8 years ago & I have hated having it shoved up in the attic for so many years. It is one of those pieces that has just not fit anywhere in the house before. Obviously, it was just waiting for this spot. 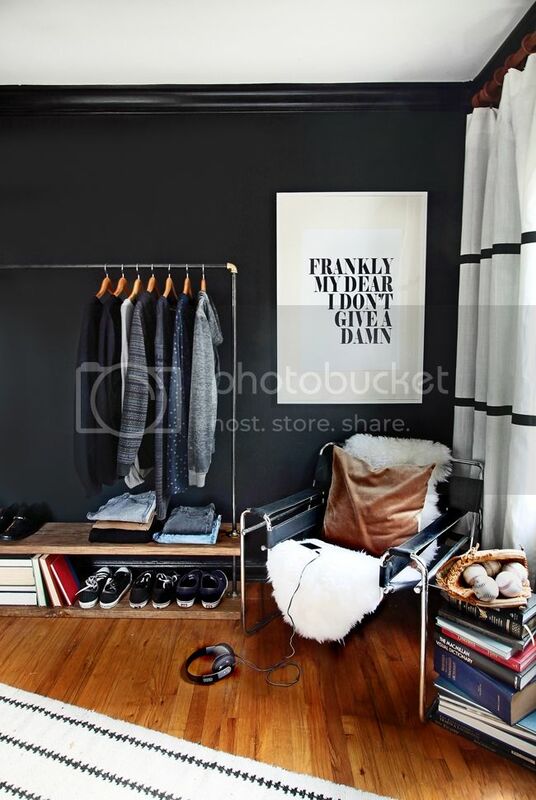 can you share where you got the black and white rug? Room looks awesome! I like the look of an open closet and did a much smaller version of this within a shelf for my daughter. We live in an old house with tiny closets, so this was a great solution for us. 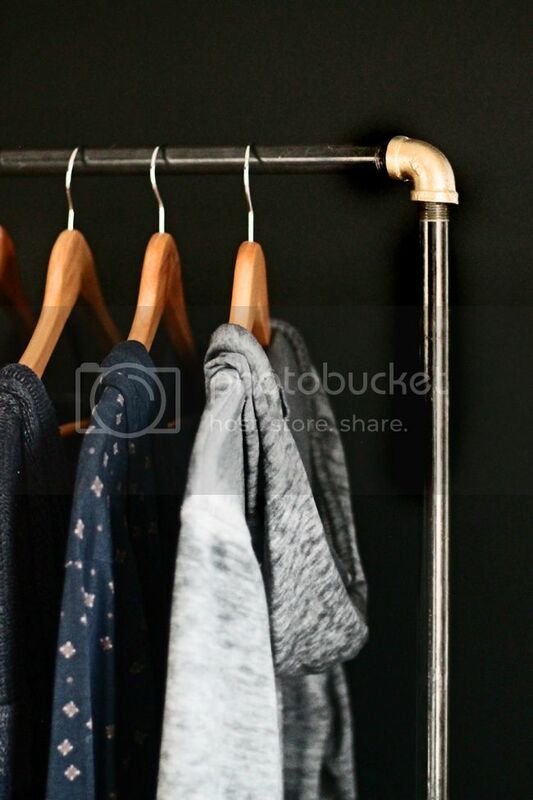 Personally I'm kind of digging the minimalist movement when it comes to clothing these days, and using a garment rack would definitely help with that. LOVE this!! The whole design is so good, well done lady! Love it! I really, really love how you've used black and white in this room as well as your living room. Where did you get the awesome curtains and curtain rod? Where did you get that amazing headboard? Great post. As a live edge furniture designer and craftsman, it is great to see a DIY project like this. These tables do not have to be $10K+ tables if you have this type of ingenuity and don't desire a high value hardwood such as walnut. Great job and wonderful stain, too! Keep up the good work.